Noragami Aragato (Season 2) contains episodes 1-13 plus a special envelope with 14 art cards, including 3 special pieces inspired by the traditional artistic stylings of the series. Life for minor god Yato isn't getting any easier. He's still broke, shrineless, and his partner-slash-sword-regalia has zero respect for him. Worse yet, Bishamon, one of the deadliest war gods, is after his life. Blaming him for the death of her past regalia, she won't stop until she kills him. But there's more to that story than she could ever realize. And as if that's not bad enough, there's someone working against her behind the scenes! Can Yato take on a god as powerful as Bishamon Or will things take a more dangerous turn? Right when he thinks things have settled down, Yato is forced into working with Nora and must brave the underworld in order to help a fellow god. The catch He may end up stuck there if he can't figure out how to escape Izanami, queen of the underworld. Between all of his godly drama, Yato still needs to figure out how to help Hiyori. But all options lead to losing her, and he's not willing to make that choice--no matter what. This is just a review on the package. Similar chipboard style to other Funimation's "limited edition" releases. Silver spine and text matches with the 1st season limited edition of Noragami. One thing to note, the bonus "special envelope with 14 art cards" DOES NOT fit in the box. They are high quality art cards but come in an envelope attached to the outside of the art box and do not fit inside the blu-ray cases nor inside the box itself. Besides the minor inconvenience of not having a place to store the art cards, this limited edition is well worth the addition to any collection. Just like I wrote in the headline everything is pretty much A+ superb except the chipboard box as it doesn't hold up to the first seasons box in quality. A different material is used so instead of the nice thick matted finish it's more of a slick shine and makes the silver look dull. Not too big of a deal, but I wish the work that was put into season 1's box was put into this one as well for the price paid. The gorgeous illustration and adorable animation art cards are definitely a nice goodie. Though like mentioned in another review they can't be placed in the box and are instead stuck to the box with a adhesive dot. I could honestly go on about the anime itself, but then I'd be writing a book. In short season 2 is an emotional rollercoaster that answers a lot of our questions about Bishamon and Yato's past along with furthering the story and introducing a couple new interesting characters. Small quality issues aside, an absolute must for any and all anime fans! 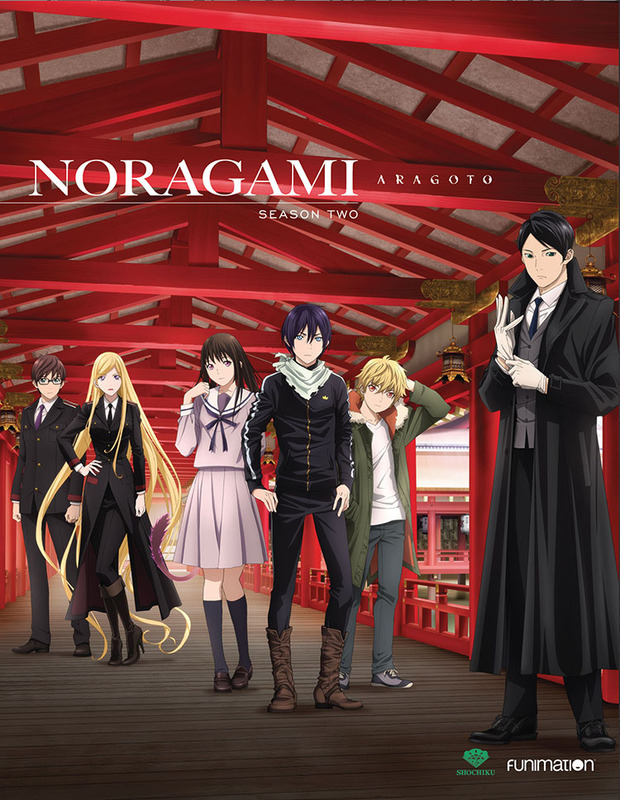 Noragami Aragato is a great anime, it is packed with lots of actions and further explains Bishamon and Yato's past. This edition comes in a box with nice art, as well as art cards though I agree with past review that the fact that they don't fit in the box is kind of a pain, but they still look great. 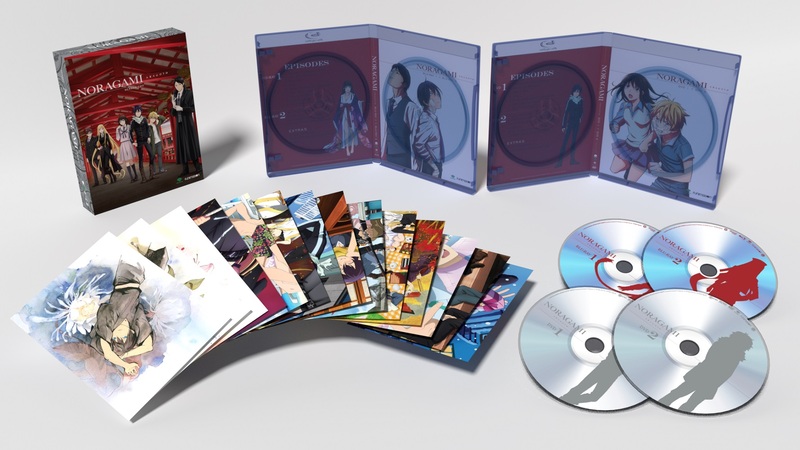 The limited edition of Noragami Aragoto comes in a nice chipboard artbox with two disc cases that have reversible jacket art; one case for the two DVDs and one for the two Blu-rays. In addition to the nice packaging, there are 14 art cards in an envelope. Even if you only have the standard edition of the first season, the limited edition for Aragoto looks great next to it. The spine side of the chipboard box is in the same sort of style as the spine of the first season, albeit about twice as wide to accommodate the two disc cases within and the thickness of the box itself. The art cards are also a nice little bonus, but, as others have mentioned, there is no room for them within the box. A minor annoyance if you want to keep everything within the box, but otherwise not a deal breaker. Go for this set. It looks great on a shelf and if you enjoyed the first season, you’re guaranteed to love the further character development and story of the second.